We’re back again for Week 11 of the NFL season to identify some sleeper candidates who could find themselves more valuable in fantasy football sooner or later. The Week 10 fantasy leaderboad is a perfect demonstration of the importance of player efficiency. 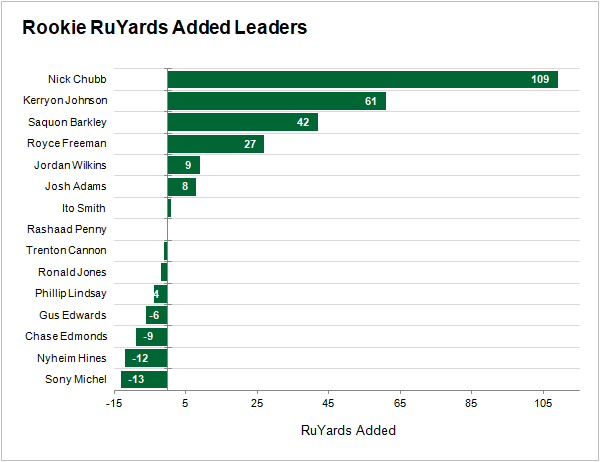 Nick Chubb and Aaron Jones were both unusable in fantasy for the bulk of the first two months of the season, but their excellence in limited opportunities made them stand out and suggested they would see increases in workload sooner or later. Now, they look like two of the most attractive running back options in time for the fantasy playoffs. My rushing and receiving Yards Added metrics compare a skill player’s yardage totals on their plays relative to expected totals based on factors like the down and distance, distance from the end zone, quality of run-blocking, and quality of coverage. As such, they are perfect tools to identify the next Chubb or Jones who could see a bump in future workload because of their efficiency. A few such players stand out as sleepers for Week 11 and beyond. Mike Davis was a capable replacement for the injured Chris Carson Sunday, racking up 58 yards on his 11 carries. Yards Added viewed it as a plus performance, but it still fell well short of that of his rookie teammate. Penny rushed 12 times for 108 yards, which helped return him to neutral Yards Added on the season. That’s a nice recovery from his total of -8 Yards Added the last time I showed this chart back in Week 5. In the short term, Penny’s breakout creates a fantasy predicament. The Seahawks run more than any team in football, but even they don’t have enough carries to buoy three capable backs in fantasy. But that’s actually good news from a sleeper perspective. The only reason Penny might be affordable or even available on the wire in your leagues is his stiff competition. But he still has multiple avenues for success. Carson is already hurt with a hip injury, and if he misses more time or if Davis does, Penny would become usable. Meanwhile, Penny’s improving play could move him up the team’s depth chart even without an injury to a teammate. Even in shallow formats, I think it makes sense to stash him. As that previous chart shows, Lions rookie Kerryon Johnson has emerged as one of the top backs in the league. That unfolded while Riddick missed a month with a knee injury, and I doubted he would have much of a role when he returned. But that was before the Golden Tate trade. Tate pretty much was the Lions’ short passing game. Over the first half of the season, his 49 targets within 10 yards of the line of scrimmage were nearly twice as many as any of his teammates. The team had some wide receiver candidates to replace him, like T.J. Jones and Brandon Powell, but it’s actually been Riddick who has paced the team with 14 shallow targets the last two weeks. Riddick is thought of as a running back, but he isn’t being used like one anymore. He doesn’t have a carry the last two weeks, and less than half of his short targets in that stretch came while he lined up as a running back. And really, that makes a lot of sense. In his best seasons (2014-15), Riddick was top-15 among all players with 55 Receiving Yards Added. He can be the team’s primary slot receiver, and that role should make him valuable in fantasy, in particular in PPR formats. Hooper is a top-10 fantasy tight end this season, so it’s not totally fair to label him a sleeper. However, many fantasy owners expected him to make a leap in each of the last two seasons, and his slow and steady improvements have allowed him to become underrated. 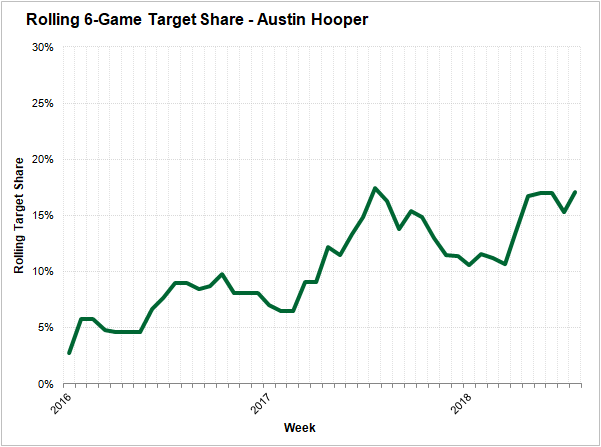 Hooper didn’t consistently crack a 10% target share until halfway through his sophomore season in 2017, but he’s lived above it exclusively ever since. 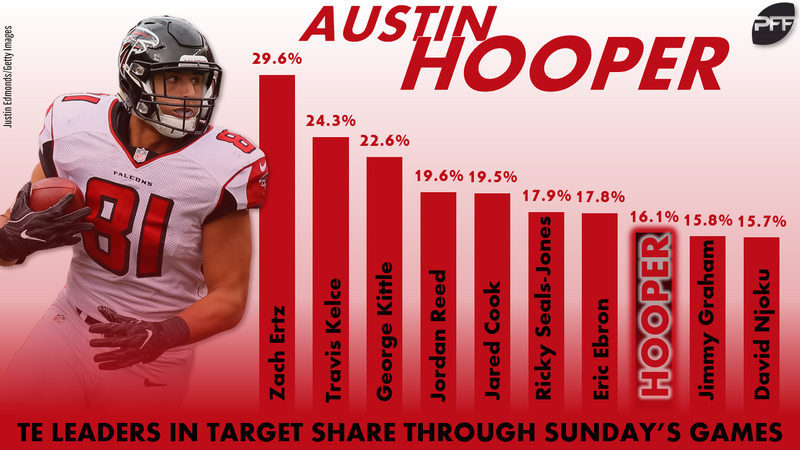 His current spike in target share over the last six weeks has him threatening a 20% target share, which only Zach Ertz, Travis Kelce, and George Kittle can boast this season. Hooper has also been a positive contributor with 9 Yards Added in his career. Touchdowns are the only roadblock between him and a top-five second half for fantasy, and his 6-4, 254-pound frame makes him a natural candidate to see more red-zone work, especially with Devonta Freeman on injured reserve. Unlike Hooper, Foster and Kirkwood definitely fit the label of sleeper. A week ago, they were both on their teams’ practice squads, and then Sunday, they were enjoying breakout performances in the NFL. Both players owe much of their excellent Week 10 efficiency to big plays, but those plays also provide me some optimism that they could develop fantasy relevance. Foster showcased excellent body control on a deep, over the shoulder catch. Then he showed the ability to adjust his route and make a catch in traffic. The experienced Bills wide receivers have been universally bad this season. Kelvin Benjamin, Zay Jones, Andre Holmes, and Terrelle Pryor have all cost the team between 6 and 15 yards. Foster is in that window, as well, but his status as a rookie makes him the likeliest to make major improvements in season, similar to what Rashaad Penny has done. Just watch out for a finger injury he sustained late in Sunday’s game. His health status is unclear for Week 12 when they return from bye. Kirkwood owes more of his 40-yard catch to play design, but that isn’t a reason to be bearish on his fantasy prospects. With Dez Bryant’s season ended before it could even begin, the Saints are desperate for bodies at receiver. I’m skeptical the newly signed Brandon Marshall in the answer. He has cost his teams more than a yard per catchable target since the start of 2017. Kirkwood could better that even if he regressed sharply from his pace of 5 Yards Added on two catchable targets. And Michael Thomas and Alvin Kamara require so much defensive attention, any Saints receiver who regularly finds the field has fantasy potential.